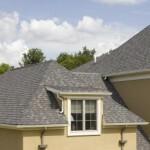 Asphalt roof­ing shin­gles are the most com­monly used cov­er­ing on res­i­den­tial prop­er­ties in the market. Asphalt’s pri­mary pur­pose in roof­ing shin­gles is to serve as a water­proof­ing agent. Asphalt also holds the gran­ules in place and adds to the over­all strength of the roof­ing shin­gle. 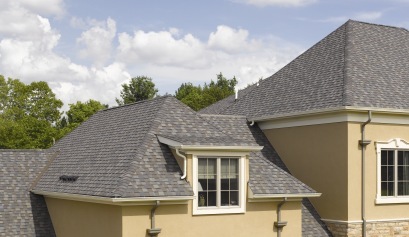 The best asphalt will stay flex­i­ble and will not dry out or become hard or brit­tle for the expected life of the roof­ing shingle. Strip asphalt roof­ing shin­gles are single-layered asphalt roof­ing shin­gles typ­i­cally designed to look like slate. Strip roof­ing shin­gles are usu­ally the light­est weight asphalt roof­ing shin­gles avail­able in the mar­ket. Built on a tough fiber glass base, each shin­gle pro­vides resis­tance to blow-off and tear­ing. 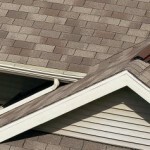 Strip roof­ing shin­gles are used pri­mar­ily by home builders man­u­fac­tur­ing econ­omy priced homes or pur­chased by home­own­ers as replace­ment roof­ing shin­gles for homes that already have strip shin­gles on the roof. Cer­tain­Teed man­u­fac­tures strip roof­ing shin­gles under the prod­uct names CT™ 20, XT™ 25, and XT™ 30. Dimen­sional asphalt roof­ing shin­gles are man­u­fac­tured as multi-layered prod­ucts and pro­vide a thicker and richer appear­ance on the roof (a multi-dimensional look). Dimen­sional roof­ing shin­gles typ­i­cally are heav­ier weight than strip roof­ing shin­gles and usu­ally have improved war­ranty pro­tec­tions, which can range from 30-years to Life­time. 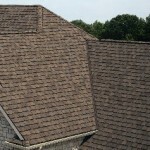 CertainTeed’s Land­mark™ Series roof­ing shin­gles are a pro­to­typ­i­cally design for a Dimen­sional roof­ing shingle. Pre­mium asphalt roof­ing shin­gles are usu­ally described as lam­i­nated shin­gles that have a dif­fer­en­ti­ated appear­ance or func­tion­al­ity from tra­di­tional dimen­sional asphalt roof­ing shin­gles. These prod­ucts may have designs that mimic “old-world” roof­ing shin­gles, like nat­ural slate or nat­ural shake roof­ing shin­gles. CertainTeed’s Grand Manor™, Pres­i­den­tial Shake™ and Cen­ten­nial Slate™ shin­gles are prime exam­ples of pre­mium roof­ing shin­gles that pro­vide an enhanced aes­thetic appeal. Pre­mium asphalt roof­ing shin­gles might also have impor­tant func­tional improve­ments such as Impact Resis­tance or Solar Reflec­tiv­ity that can pos­si­bly extend the life of the roof­ing sys­tem or pro­vide lower energy costs. Land­mark™ Spe­cial and Land­mark Solaris™ would be pri­mary exam­ples of pre­mium asphalt roof­ing shin­gles that pro­vide enhanced func­tional performance.